Right after Christmas, Hope heartlessly deserted the cats (AGAIN) and flew off to California. 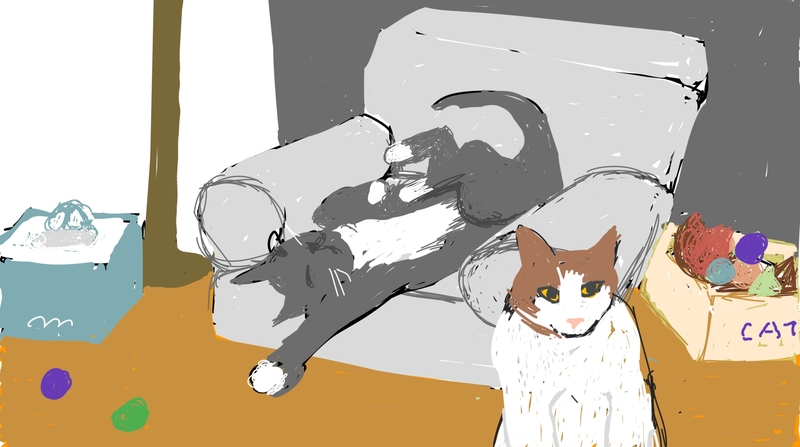 There she met 2 cats who live in the LAP OF LUXURY, Sonny and Rocky (short for Mendelssohn and Rachmaninoff). They have every toy a cat could desire, a working fountain, and elegant cat perches in front of the windows. 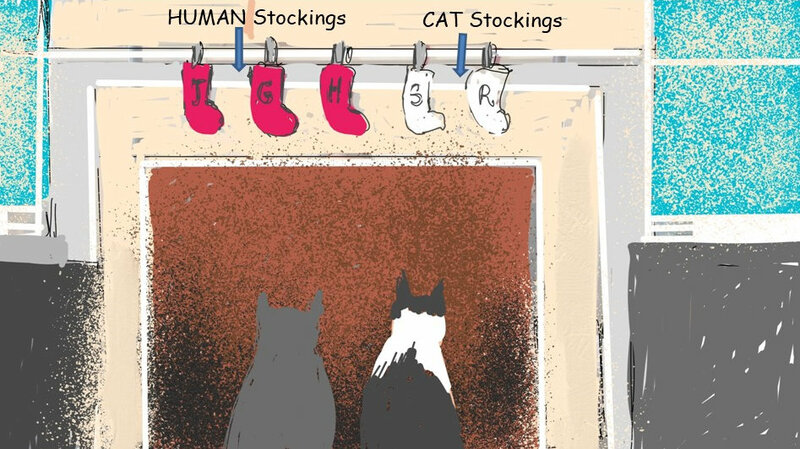 They even have THEIR OWN CHRISTMAS STOCKINGS. 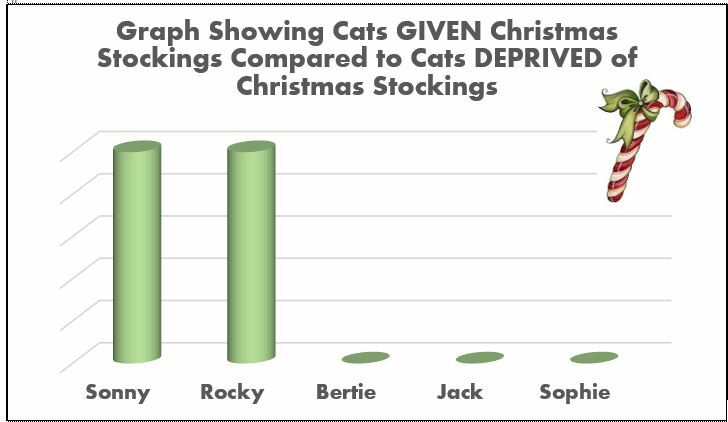 NOTE: Bertie, Jack, and Sophie NEVER get Christmas stockings. Not that they would ever complain, of course. The owners of the California cats are so gentle and good that their cats have more or less carte blanche. These cats are young and wild, and have a passion for anything remotely edible. Hope learned quickly not to leave even a crust of bread unguarded. 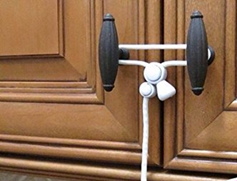 The cabinets in the kitchen are defended by cord locks, which however are not impregnable. A nimble cat can poke a paw into the cabinet if the cord is not tightly drawn, and pull out, for instance, A WHOLE BAG OF BREAD. HA HA! They would have eaten the whole loaf had they not been betrayed by the sound of the plastic bag being methodically torn apart. 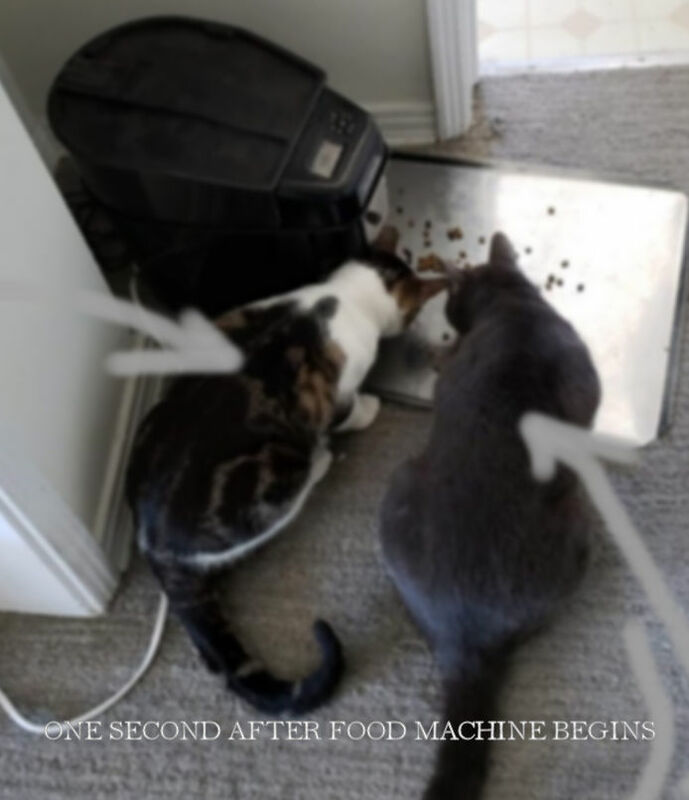 The reason the locks had been installed was that one day when both owners were out, the cats had managed to pull down a whole bag of delicious cat food. Sonny gained a pound in ONE DAY. It is not of course that they are left to starve. They get a lovely dinner of the premium cat food every night, plus dry food delivered at timed intervals by a fantastic machine. It is a riveting experience to see those cats LEVITATE and RACE OVER IN A BLUR OF FELINE SPEED when the feeder starts spitting out the pellets. All in all, a very entertaining visit for Hope. Also there was a new baby, but aside from his ability to make quite an astonishing racket, the cats have no opinion of him. I spent my time last week in tending to my angel grandson, who is a completely charming fellow, ready to sing or dance or listen to stories or do whatever seems the best way to enjoy life. It’s true there were some rather nasty diapers to deal with, and I must admit that one begins to tire of the Cat in the Hat after the 5th iteration or so–though, I LOVE that book, it always makes me smile: I know it is wet and the sun is not sunny–but we can have lots of good fun that is funny! Dino simply adores that Cat and his Hat. 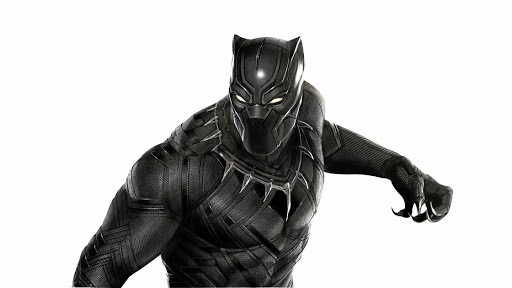 Once Dino was abed, I watched movies on my computer–Amazon offered me Black Panther for a trifling wee sum, and I gladly concurred. 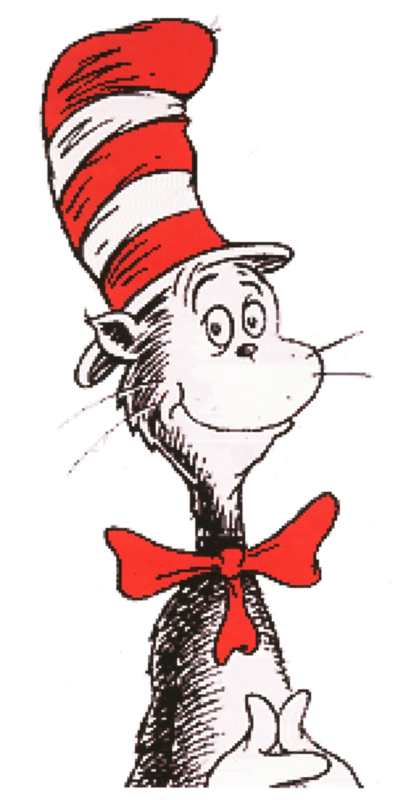 Well, well–another cat in a hat! Though this one is very handsome, not to mention noble and inspiring and all. He is KING! Of Wakanda, a splendid country filled with grand technology based on some very powerful, uh, mineral or something, called….VIBRANIUM. This very important substance is very valuable indeed, and makes all Wakandans very wealthy and strong. Also, they have blissful African ways and beat drums and dress magnificently. Things happen, large men fight by beautiful waterfalls, smart ladies engage in fancy feats of skill. What can I say–it was very entertaining. Also— there were rhinoceroses IN ARMOR! Really, quite irresistible. 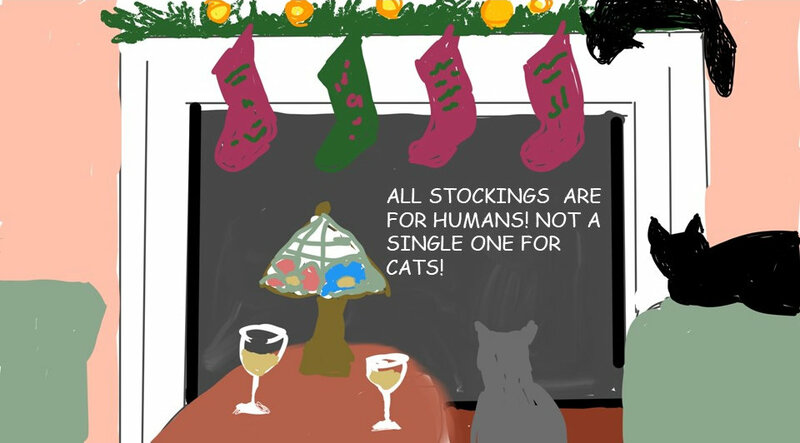 Stoutly hewing to our 2017 Viewing Resolution: playful piffle only, no beheadings/ no politics!– the cats and I recently gathered on the sofa to watch the Secret Life of Pets. While derivative and predictable, this is also a charming movie–cheeky characterizations of dogs, cats, hamsters–and their loving relationships with their humans. My favorite was the chic poodle, Leonard. See, we are in trendy Brooklyn, and all the hipster humans are taking leave of their beloved pets to go to work. In Leonard’s apartment, decorous classical music (Vivaldi) is playing on the sound system. His elegant owner gives him a pat, and tells him to be a good dog—and off he goes. The door shuts. BAM! Leonard flips the music to HEAD BANGING SCREAMING HEAVY METAL and goes K-K-K-KRAZY, bucking and dancing like his back ain’t got no bone! 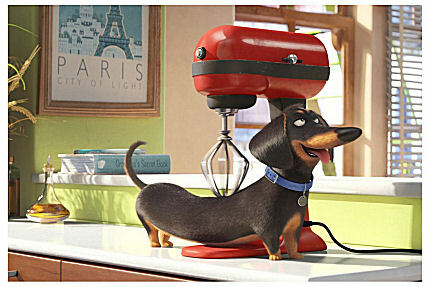 And then there is Buddy the dachshund, who has discovered an interesting use for the Cuisinart stand mixer: masseuse! Plot happens: Wild and Wacky car chases, trucks speeding across the Brooklyn Bridge (“No Sleep Till Brooklyn!”), some very VERY BAD CATS, and a ferocious crazed bunny. And an alligator! But in the end, you will be relieved to hear, everything turns out all right, and when the Brooklynites return to their spiffy apartments that evening, all the pets are home, rapturously greeting their humans. Our view draws back to show the glowing windows in each lovely old building, pets and humans silhouetted in their various ways of embracing each other. Yes, a little labored, a little silly. But charming enough. And a movie that ends with such a loving vision will do very well. AND beheading-free, as I mentioned. By way of restoring the soul between riveting BUT HORRIFYING episodes of Game of Thrones, I have been watching a nature series called Africa, narrated by—of course–Sir David Attenborough (who is now about a hundred and five or so). One astonishingly fabulous vision after another—I found that my jaw was quite literally dropping open in sheer amazement. As for instance, at the huge panorama of a million million pale pink flamingos feeding in the strange soda lakes of the Great Rift Valley. Or, a giraffe battle in the Namib desert—the giraffes whip each other with their long stately necks in an oddly beautiful dance (except that both victor and loser are bloody and bruised afterwards). There was a particularly charming scene, filmed at night, showing a group of black rhinos—normally solitary creatures—who gathered at a waterhole, appearing to greet each other with great good cheer. One young male, having been dismissed by haughty female, reappeared bedecked with an antelope skull, the long horns forming a sort of perky hat. WELL! She was captivated, and a rhino dalliance ensued. Not perhaps a very graceful proceeding, but there, we can’t all be Baryshnikovs. Except the springboks, that is—they outdo any human dancer. 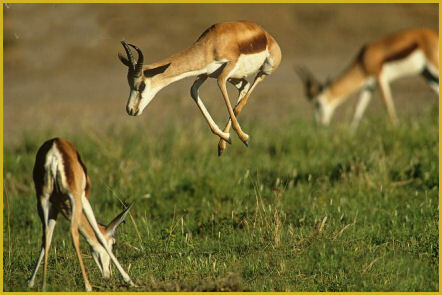 There is even a name for their acrobatic bounding about: pronking. As Sir David says, it’s hard not to think they are leaping for the very joy of it. Among many breathtaking scenes—good lord, the Dragon’s Breath Cave!—the odyssey of the King Fish stays with me—completely mysterious, completely splendid. These enormous and powerful fish have a unique custom: periodically, they gather together and leave the ocean to swim up the Mtentu River, deep into the interior. Once arrived at the place they seek, they gather into a vast ring and dance in a circle. And then they turn and go back to the ocean. No one knows why. Except the King fish of course. As I said, it made my jaw drop, just drop. It reminds me of a recent story about an archaeological find in Turkey, Göbekli Tepe, a site of great age, built possibly 11 thousand years ago—whose elaborately carved monoliths imply a technology that seems impossible in a time when humans still lived in small hunter-gatherer groups. And yet, there it stands. Whenever you hear someone announcing that the science is settled, that he knows all the answers, ask him about the King fish’s dance. Ask him about Göbekli Tepe. Not one to learn from experience, Jack once again tried to dislodge Bertie from his place on the bed. Once again, Bertie stood firm, once again I awoke in wroth, and tossed the wicked creature out, with a few choice words to speed him on his way. Well, Jack went galloping down the stairs and I heard him doing that mad rush from room to room which cats do from time to time. Then he slowly climbed the back up the stairs—but stopped at the door. He couldn’t get up the courage to reenter the scene of the crime. And he started to cry. Little cat cries of sorrow and distress. How could I withstand it? 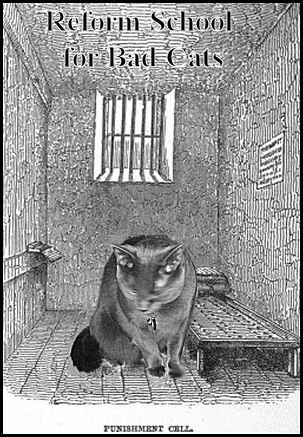 I came out, gathered him in my arms, assured him that I would not really be sending him to the Reform School for Bad Cats, and allowed him back on the bed, where he respectfully honored Bertie’s primary position. And all night long they loyally performed the traditional Task of the Cat, of keeping my legs pinned down and immobile. The street in front of my office was lined with Barnum and Bailey circus trailers! Filled, one supposes, with sparkly costumes, trapeze equipment, clown noses. Possibly bears? 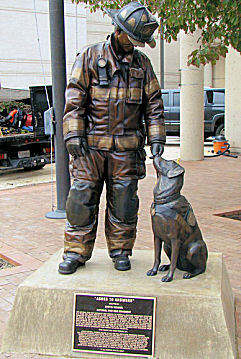 There is a charming statue in front of the fire station by my building: a fireman and his devoted dog. As I walked by, a lady went up the step to the statue, her wee white poodle on a leash behind her. He balked at the step, which towered over his tiny frizzled head. She cooed encouraging words, but he steadfastly refused. 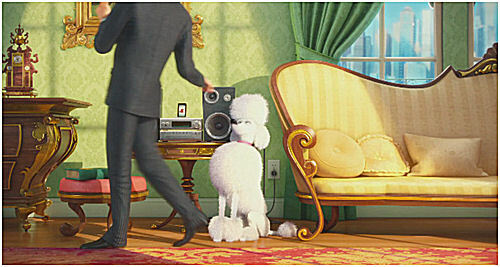 That poodle did NOT care for fine arts. 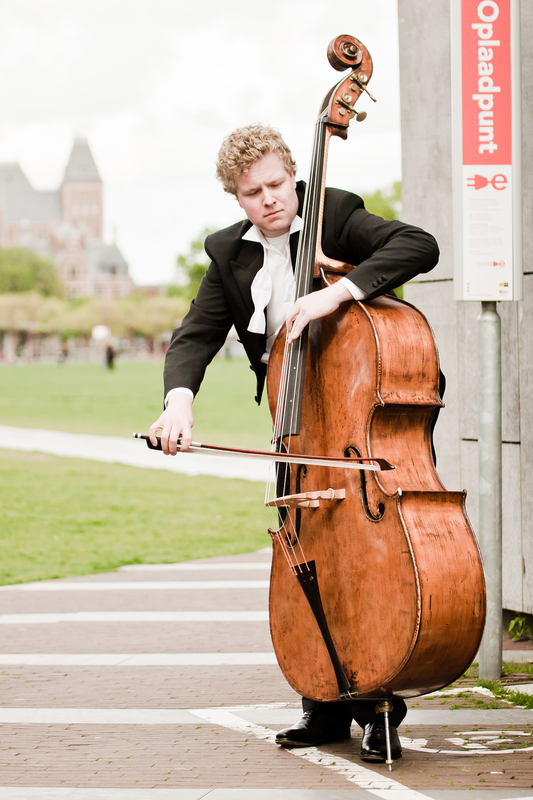 At the entrance to the subway, a young man stood with his large double bass, bowing away with a will. Unfortunately, the sound was drowned by the wind and the traffic. After work, I went to the grocery store, and then to the drug store. Which was CLOSED–?? There was a police car winking and blinking at the corner, and yellow police tapes strung about. 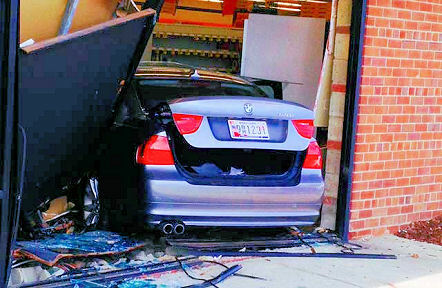 As I drove past I saw a car had driven right INTO the store, and was nestled among the Easter candy and broken glass. A very impatient shopper, I suppose. And today it’s snowing. On the first day of Spring. It appears that Bertie finds all this FUSS about Sophie tiresome–so WHAT that she leaps upon tall furniture, so WHAT that she’s so naughty, so WHAT that she has the big fluffy tail. Bertie has his own spark of Divine Fire! He could do ALL those things (except the fluffy part) if he wanted to, but he doesn’t because he has a decent sense of what’s proper. However, last night was the last straw, what with Sophie getting a long private cuddling session–all other cats excluded–and no cozy detective drama watching time. 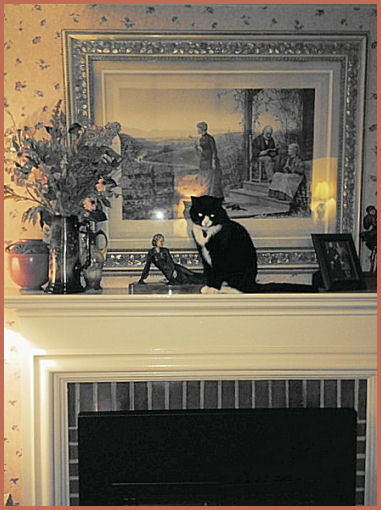 When I came into the living room, Bertie calmly confronted me from the MANTEL PIECE. Forbidden to cats, because of dainty objets d’art. He too can be naughty! He too has the cuteness! And his tail–while not FLUFFY–is a fine appendage! After the obligatory protest–one must keep up appearances–I told Bertie that he was the king of the cats, and we spent some quality time together. Well, ANY time with Bertie is quality time.